We’ve been told for a long time that a picture is worth a thousand words. With that in mind, the images that we saw Sunday night about 10:00 must be worth at least 100,000 words. Or maybe something closer to epic proportions, somewhere in the neighborhood of War and Peace. There was Gerard Gallant, bags in hand, grabbing his own cab. One Carolina Hurricanes employee was assisting him, which accentuated the matter even more. In his time of departure from the Florida Panthers and lowest point within the organization, Gallant’s sole help was a worker from a former Southeast Division rival. In the high stakes game of Optics, which is enormous these days (Google “National Election” images), the Panthers came off looking terrible on a Sunday night. Worse than the worst segment ever of 60 Minutes. Or if you’re over 45, the most woeful melodramatic episode ever of Murder, She Wrote. Rumors had been swirling like a furiously forming funnel cloud that Gallant’s days in Florida could be coming to a close. A 3- or 4-game losing streak might just be Gallant’s last straw, but one loss? One particularly bad loss to a mediocre Hurricanes team that is extremely young and played most of the game without its top center? Unabashedly, I admit to liking the Panthers. I’ve covered them since Pete DeBoer’s first season, and my duties have expanded greatly in that time beyond anything I had ever imagined. When they lose, it stings some. Hey, prosperity’s a good thing, and business is better for everyone when the Cats are winning like last season, breaking records and being the lead NHL story on occasion. When my wife saw me sulking a bit and asked, “Is someone upset because his team lost?”, my eight-year-old son — the real hockey fan in the house — looked over his shoulder from his computer hockey game and set the record straight. “Everyone gets upset when their team loses,” he said simply. Apparently that goes for Florida’s management, too. And it literally is their team. 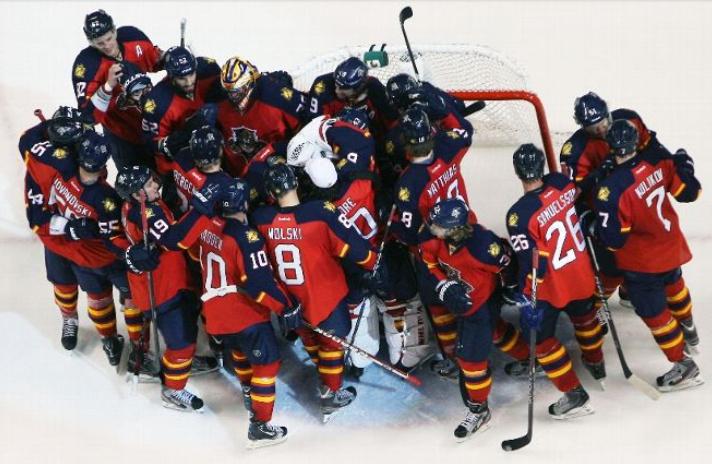 That said, Sunday night won’t go down as one of the better moments for the Florida Panthers. Gallant was a great guy to work with. Even when angry or perturbed by something, that grin seemed to widen and those teeth flashed as he prepared to deliver the reasons why. He didn’t single out players often, but he didn’t cover up the mistakes that were made either. He’s appreciated around the league, and the perception of him is a good, strong one. The media likes him, and he’s viewed as a good hockey guy. If you’re setting the scene at home, management will be playing the role of the Big Bad Wolf in this story, folks. But the bottom line is this: There was a gulf that existed between Gallant and management. Gallant bristled at some of the decisions made by the brass, but their final one that concerned him was inevitable. It could have happened last night or in Chicago or Detroit later in the week, but it was coming. That funnel cloud finally formed over Gallant, and he couldn’t escape it. The growing discontent between Gallant and management would never go away. Now it’s on ownership, though, and they’re just as culpable as Gallant. They secured the future by making long-term decisions and locking up the core. That’s great. But with over $5 million left in salary cap, they failed to address the present state of secondary scoring, which has usually been a problem for the Panthers as long I’ve been here. Particularly of issue is the third line and the team’s offense, which ranks in the NHL’s lower half in almost every significant category. Some players on the third line are rookies, castoffs, borderline AHLers or some with marginal skills that should be playing on the fourth line. With Nick Bjugstad out, Gallant tinkered with that line incessantly, trying to make something out of it and establishing some consistency, but he couldn’t. While spitballing some hot stove talk in July, a colleague and I often talked about many possible free-agent acquisitions. Two that came up frequently were Austrians Michael Grabner and Thomas Vanek. An energetic player like the former 30-goal Michael Grabner or proven scorer like Vanek were both available on the cheap to shore up the third line, even before Bjugstad’s late preseason injury. Both wingers are having standout years. Grabner has 12 goals and is his usual reliable self on the PK, and he’s a ridiculous plus-20 for the Rangers. Vanek has been nicked up a bit but is almost a point a game for Detroit. The Rangers paid less than $2 million per Grabner, Detroit slightly more for Vanek. Meanwhile, the Panthers still have a hole at wing. One of these seasoned vets could have brought production to a line that had gaping holes on both wings and kept Bjugstad in the middle, but management hope a youngster would step up. It was a gamble that hasn’t paid off. Grabs or Vanek would have helped offensively and pushed players getting third-line minutes to the fourth line, too, making it more productive in the process. I didn’t want Gallant necessarily, but I grew to like him. No one asked me, but I had my sights on Guy Boucher and his Mad Scientist approach to coaching. Boucher took the Lightning to within one goal of the Stanley Cup Final with a goalie tandem of Dwayne Roloson, Dan Ellis (remember him?) and Mike Smith. Think about that for a minute. Now Boucher is in Ottawa, the Senators are in second in the Atlantic Division and GM Tom Rowe is the Panthers’ new bench boss. It’s quite an ascendancy from Rowe’s stint in the AHL to Florida’s front office and now to the bench, albeit in an interim role. The onus will be on him to get the team, which is likely a little ticked off at losing Gallant, back on task of chasing Montreal, Ottawa and Tampa for a divisional spot. Last night was a lot about Gallant — those images, again, were bad and will be played out too much for anyone’s liking — and the players will always have to own up to their play on the ice. But now with Rowe coaching the team, this is mostly about the brass, less on the players and not on Gallant at all.